Katherine Marshall is a Senior Fellow at the Berkley Center for Religion, Peace, and World Affairs, and Visiting Professor in the Government Department and the School of Foreign Service, Georgetown University. She is also the Executive Director of the World Faiths Development Dialogue. Her current work focuses on teaching and research on a wide range of topics at the intersection of development and religion. 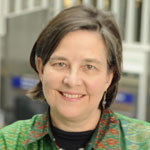 She leads the Berkley Center’s work on faith-inspired institutions working in development, which involves a series of regional background papers and consultations with academics and practitioners, and a series of reviews of specific development topics (HIV/AIDS, gender, and shelter).